A soup made with peas and mint. 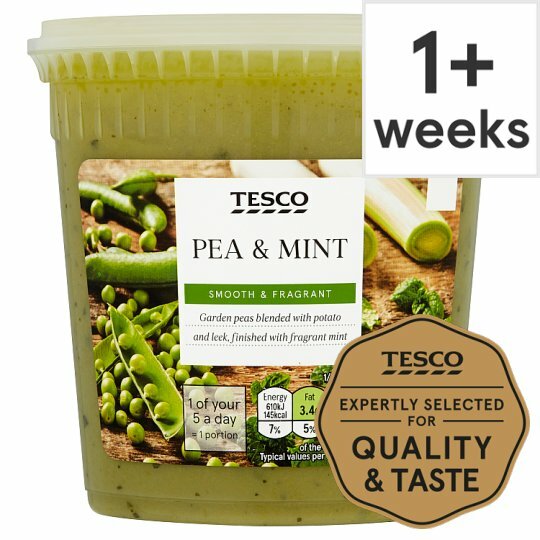 Smooth & Fragrant Garden peas blended with potato and leek, finished with fragrant mint. Just as you would when cooking a soup at home, our experts sauté onions and garlic to create a base and build flavours with selected vegetables and seasoning. Vegetable Stock, Peas (35%), Potato, Onion, Leek, Rapeseed Oil, Mint, Salt, Garlic Purée, Black Pepper. Vegetable Stock contains: Water, Sugar, Salt, Onion Concentrate, Carrot Concentrate, Sunflower Oil, Cornflour, Leek Concentrate, Celery Concentrate, Garlic Concentrate, Nutmeg Oil.